The Board of Directors come from each of the four continental flyways: Pacific, Central, Mississippi, and Atlantic. 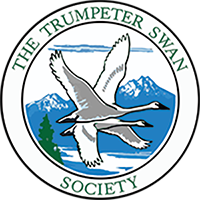 The Trumpeter Swan Society Board includes men and women with many years of Trumpeter Swan and waterfowl experience, agency leadership experience, and business, investment and legal expertise. Carey Smith worked for 36 years with the U.S. Fish and Wildlife Service. Positions held include Pacific Flyway Biologist, Regional Refuge Biologist, Chief of the Division of Biological support, and Pacific Coast Joint Venture Coordinator. These positions included work as a pilot/biologist responsible for waterfowl surveys and banding from the Yukon to the Yucatan, oversight of more than one hundred National Wildlife Refuges in seven western states, and working as part of an international collaboration of agencies, nonprofits, tribes, and corporations formed to acquire and restore bird habitat along the Pacific coast and the Hawaiian Islands. Dave Hoffman is a wildlife research technician with the Iowa Department of Natural Resources and has been involved with the Iowa DNR's Trumpeter Swan restoration program since 1995. Dave works in partnership with multiple state and federal agencies on Trumpeter Swan issues. He has been active with TTSS for many years and has attended and presented at numerous TTSS conferences. Mike Anderson is presently Emeritus Scientist at the Institute for Wetland and Waterfowl Research. He helped found the Institute in 1991 and was employed with Ducks Unlimited Canada from 1990-2013. Before retiring, Dr. Anderson had broad responsibilities for DU’s scientific investments and adaptive management culture. He also assisted with strategic and operational planning for DU nationally. Prior to joining DU, Mike spent 18 years at the Delta Waterfowl and Wetlands Research Station, last serving as the Station’s Director. He has been involved in waterfowl research, primarily on the Canadian prairies, since 1972. Mike has been engaged in national- and international-level waterfowl management working groups for nearly 30 years. He continues to serve on the North American Waterfowl Management Plan's International Plan Committee and related technical teams, writes articles for scientific journals and outdoor magazines, and recently edited a book. As a staff veterinarian in the 1980s at the Raptor Center of the University of Minnesota, Laurie Degernes became involved in Trumpeter Swan health issues as Minnesota ramped up its swan restoration program in the mid-1980s. In the late 1980s, she treated over 70 lead poisoned swans from MN and WI and helped develop a new treatment protocol for removing lead shot from the gizzard (“gastric lavage”), a technique that is still widely used today for treating lead poisoned waterfowl and other birds. After moving to North Carolina in 1990 she joined the faculty at North Carolina State University and retired as Professor of Avian Medicine in 2016. Her Masters of Public Health paper was on the epidemiologic investigation of wild swan mortality in Washington State, supported in part by TTSS. In addition to teaching veterinary students, she published multiple manuscripts and spoke at many state, national, and international conferences. She is now Professor Emerita of Avian Medicine. Jim first encountered Trumpeter Swans in Alaska while working on the Copper River Delta during the late 1970s. He took his interest in the species with him to Whitehorse after graduation, where he worked for 29 years as a biologist for the Canadian Wildlife Service. He has spearheaded that region’s participation in the North American Trumpeter Swan Survey since 1995, and has also taken a special interest in swan migration areas in the southern Yukon. Jim’s part of the continent is characterized by pristine wilderness and he is a strong advocate of Trumpeter Swans as a flagship species for healthy wetlands. He has been a member of TTSS since the early 80s. Carrol Henderson was supervisor of the Minnesota Department of Natural Resources- Nongame Wildlife Program, a program he created, since 1977, until his retirement in 2018. During those 40 years he developed a statewide program for the conservation of nongame wildlife that has received both national and international recognition. He helped plan and carry out restoration of peregrine falcons, bald eagles, eastern bluebirds, river otters and trumpeter swans in Minnesota. Carrol is the author or co-author of 13 books including Woodworking for Wildlife, Landscaping for Wildlife, Wild About Birds: the DNR Bird Feeding Guide, Birds in Flight: The Art and Science of How Birds Fly, Oology and Ralph's Talking Eggs, and the Field Guide to the Wildlife of Costa Rica. The Minnesota DNR Nongame Wildlife Program and the state nongame wildlife checkoff on state tax forms was organized to expand on Hennepin County’s swan restoration program to restore Trumpeter Swans elsewhere in Minnesota in 1982. Kyna Intini began volunteering with the Ontario Trumpeter Swan Restoration Program in 2007, when she met Beverly and Ray Kingdon who were banding Trumpeter swans at La Salle Park in Burlington. She has continued to work with the program since then, learning to catch, band and monitor the movements of the swans, keeping records of sightings and earning her banding license. She also holds Wildlife Custodian permits from both the Ministry of Natural Resources and Forestry and the Canada Wildlife Service to be able to rehabilitate injured wild swans. She worked as a Registered Veterinary Technician in small animal clinics before continuing her education at McMaster University. Since then she has done contract work with Environment Canada at the Canada Center for Inland Waters. Jeff Nelson worked for 30 years with Ducks Unlimited in both the U.S. and Canada, finishing his career with the organization as Chief Executive Officer at DU Canada. While at DU, he served in several positions including in the U.S. as Chief Biologist and Director of the Great Plains Regional Office in Bismarck. He recently retired from the World Wildlife Fund after six years as Deputy Director for their Northern Great Plains program. Jeff has served on the boards of the Prairie Pothole Joint Venture, Northern Great Plains Joint Venture (co-chair), Wildlife Habitat Canada, and Ducks Unlimited Canada. He remains focused on conservation of the continent's grasslands and the birds that depend on them. Jeff spends his free time hunting, fishing, hiking, and enjoying the great outdoors with his family, both in Montana and Nova Scotia, Canada. Richard “Perk” W. Perkins, C.F.A., President and Portfolio Manager of Perkins Capital Management, Inc., has over 50 years’ experience in the investment business. His financial investment career includes Assistant Investment Manager of the Mayo Foundation Endowment Fund, Pension Fund Manager for Standard Oil Company of Ohio, Vice President of Piper, Jaffray & Hopwood, Inc. and Senior Vice President Piper, Jaffray & Hopwood, Inc’s International Department, where he provided investment advice to both domestic and foreign institutions. He founded Perkins Capital Management, Inc., in 1984. He is President of Perkins Foundation and Perkins and Partners, Inc. He has served on numerous boards over the past several decades. He is an avid decoy collector. Steve Quarles is a partner in the Washington, D.C. office of the law firm Nossaman LLP. He is a veteran attorney who focuses his practice on addressing issues concerning federal wildlife laws (Endangered Species Act, Migratory Bird Treaty Act, and Bald and Golden Eagle Protection Act), federal lands and resources (including resource use, siting, and access law), and renewable energy. He represents a wide range of associations and companies, policy coalitions, state governments, local governments, land conservation trusts, and environmental organizations. He has served in high positions in the U.S. Department of the Interior and on the U.S. Senate Committee on Energy and Natural Resources. He is active as an officer and member of the Board of several non-profit organizations including the National Wildlife Refuge Association. Carl Woodward has been practicing law for nearly 50 years. He has a broad integrated practice with specializations in environmental, municipal, zoning and planning, real estate, insurance and criminal law, and litigation in state and federal courts. Mr. Woodward was appointed an Assistant United States Attorney for the District of New Jersey in 1971, has served as Chief of the Environmental Protection Division, has been trustee of the New Jersey Institute of Local Government Attorneys, has lectured on various topics in municipal law, and has taught zoning and planning at Seton Hall Law School as an adjunct professor. Carl is an avid birder. He is on the Boards of the National Wildlife Refuge Association and the Friends of Malheur National Wildlife Refuge. Education: B.S. (Biology) Calvin College, MBA, University of Michigan. Margaret worked for the Kinnickinnic River Land Trust, working in land conservation and leading the KRLT's national accreditation application to become the first Wisconsin land trust to be nationally accredited. She served as Executive Director at the Great River Road Visitor and Learning Center in Prescott, Wisconsin, one of more than 60 Interpretive Centers on the Great River Road, a Watchable Wildlife Site and a Great River Road Audubon Birding Trail site. She has served on the board of tourism and chamber of commerce organizations and the St Croix National Heritage Area Task Force. She has been a certified Wisconsin Master Gardener since 1997. She is a Certified St. Croix Master Watershed Steward. Becca Conser is a lifelong birder and is especially interested in waterfowl, thanks to her grandfather. She is also a Volunteer Coordinator at Three Rivers Park District and has been the owner of a fiber arts business for a decade. After military service and graduate school, John worked for the U.S. Fish and Wildlife Service (FWS) as a Refuge Biologist at Malheur NWR and Western Oregon Refuges. He was the FWS Regional Migratory Bird Program Chief for 20 years. He became the 2nd Executive Director of TTSS in 2007 and assumed his current role in 2014. John has over 45 years' experience in Trumpeter Swan ecology and management. He has served on the Boards of Directors for TTSS and the National Wildlife Refuge Association. Gary Ivey began working with Trumpeter Swans in 1980 when he initiated a neck-collar/migration study at Oregon's Malheur National Wildlife Refuge and has continued his work to restore the Oregon Trumpeter flock in partnership with local agencies. He worked as a wildlife biologist for 18 years with the U.S. Fish and Wildlife Service at several western refuges, serving 15 years at Malheur NWR. Gary is currently employed as a Research Associate with the International Crane Foundation with a focus on conservation of Sandhill Crane populations and their habitats in the western U.S. Following military service, Bob Blohm's graduate work included studying the breeding ecology of the Gadwall in southern Manitoba. In 1979, he was hired by the U.S. Fish and Wildlife Service, Office of Migratory Bird Management. He remained in the Office (now Division) of Migratory Bird Management for his entire career, becoming Chief of the Division in 2007. Retired since 2011, Bob continues to enjoy a wide variety of outdoor pursuits. Jerry Serie retired from the U.S. Fish and Wildlife Service in 2007 as a Wildlife Biologist with 35 years of experience working on migratory birds. He started in research studying the breeding biology and migration ecology of canvasbacks in 1971 with the Northern Prairie Wildlife Research Center, Jamestown, ND. In 1984, he moved to the east coast as the Atlantic Flyway Representative for the Division of Migratory Bird Management where he advised migratory bird management and research to the 17 States and 6 Canadian Provinces making up the Atlantic Flyway Council. Please contact Board of Directors and Staff through our main office on the Contact Us page.